Football teams at any level want to build their roster around a quarterback, the most important position in the game. This is especially true in recruiting at the collegiate level. 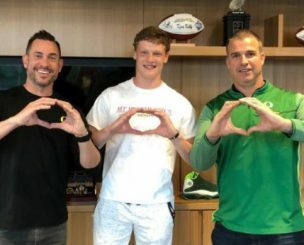 The Oregon Ducks 2019 early signing period is only a few weeks away, and they have a commitment from a good one in Mount Si High School signal caller Cale Millen from Snoqualmie, Washington. 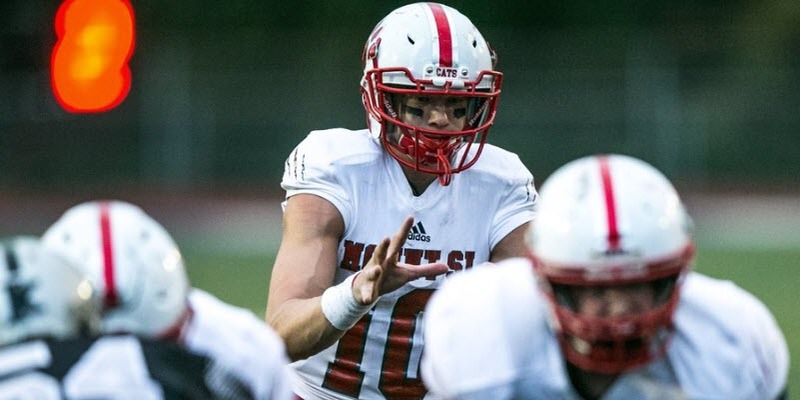 Millen made the 2018 Elite 11 roster on the strength of an impressive junior year campaign in which he was named All-King County and threw for over 2,400 yards and 32 touchdowns. His senior year just finished and his on-field production improved, as one would think. In eleven games Millen threw for over 3,400 yards and 47 touchdowns with only 6 interceptions, while completing over 75% of his pass attempts. For his high school career, he passed for nearly 8,000 yards, 100 touchdowns, while surrendering only 18 interceptions. His 5.5:1 touchdown-to-interception ratio with a 75.4% completion rate is impressive, and consistent with what a premier-level quarterback should produce. Millen finished his senior season ranked at No. 50 in the country in passing yards, but was at the top of that group in Quarterback Rating with a Top-10 rating of 138.7. It should br noted that six of the nine quarterbacks rated higher than him were dual-threat QB’s. The distinction being that typically dual-threat quarterbacks (by their nature) do not carry the average yards-per-attempt that a pro-style QB carries, because they’re not throwing down field as much. Cale is the oldest son of former Washington quarterback Hugh Millen, who led the Huskies to a victory over the Oklahoma Sooners in the 1985 Orange Bowl. The elder Millen is a Top-20 All-Time Passing leader in Washington Huskies history, and was drafted in the third round (No. 71 overall) by the Los Angeles Rams in 1987. He went on to play for six other teams in a ten-year career in the NFL. Cale Millen has been reported in the media as 6-foot-3 to 6-foot-4 and between 190 pounds and 200 pounds. Andrew Nemec of The Oregonian states that he is 6-foot-3 and 190 pounds on the low end, and the recruiting website MaxPreps.com lists him at 6-foot-4 and 200 pounds on the high end. ESPN.com chimes in with their opinion that he is 6-foot-4 and 192 pounds. Millen participated in two Nike-sponsored The Opening-Regionals combine events in the spring of 2018. At the Dallas, Texas event April 29, 2018 he recorded a total score of 101.79. And two weeks later at Las Vegas, Nevada (May 12th) he recorded a remarkably similar score of 101.43. If a kid scores over 100 he is considered a great athlete. A score of 110 to 125 is an elite-level athlete, and anything over 125 is “freak” territory. To put this into perspective: in the 2018 recruiting cycle only 27 quarterback participants scored higher than Millen, and of that group 19 appear to be dual-threat (smaller, more athletic) prospects. 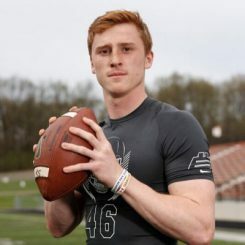 Of the remaining eight pro-style quarterbacks, only one was also an Elite-11 regional finalist like Millen, and that was Max Duggan of Council Bluffs, Iowa who is committed to Texas Christian University. I haven’t seen anything in the media as to Millen’s arm length or hand size, but for similar sized athletes an arm length of 31-1/2″ to 32-3/4″ and a hand size of 9″ to 9-7/8″ would be expected. Cale Millen has the preferred size for the position. He is a rare athlete, with the heritage of a father who played the game in the NFL for ten years. He has been the beneficiary (we assume) of countless “chalk talks” with his dad on how to play the position, and it shows up in his film. In the video above, Cale displays the touch required to throw a “Garbage Can” throw up the sideline. These are very difficult because the target is moving directly away from the quarterback. Millen, in the video above, does a nice job of keeping his focus on his targets while moving around to extend the play. Cale Millen exhibited rare athleticism at a young age, like in the dunk video above. Above, Millen flashes his considerable quarterback skills, hitting receivers at all three levels of the route tree. On first down he hits a receiver in stride for a big gain. On his second throw he “climbs the pocket” and fires a completion in the middle of the field. And on the third pass, he gets his team within range for the game-winning field goal. This an impressive 93-yard drive for a 16-year old. In the video above, Millen fires a deep curl (or comeback) with velocity. This is a “Big Boy” throw. He has a nice compact throwing motion with a very quick release. One of the fastest “clocks” I have seen on tape of high school quarterbacks. The ball really comes out in a hurry. Above Millen changes the play at the line of scrimmage. His recognition of mismatches (particularly at the back end) in pre-snap reads is at an elite level. His junior tape is full of film clips where he is audibling out of play due to a read. In the video, Millen above does a nice job of progressing to a second receiver on skinny post up the middle. His mechanics look better in this clip. He anchored his trail leg and generated the transfer of torque to his lead leg. This creates the velocity required to drive the ball down the field. In the video above, Millen flashes his development as a quarterback in a two-minute drill situation. He utilizes all of his receivers at all three levels in six throws, capping off the drive with a fade in the corner for a touchdown. In the video above, Millen changes the play at the line of scrimmage to take advantage of a pre-snap blitz read. He recognized the cornerback was isolated in Man Coverage and NOT crowding his receiver in the press. With all of that green grass behind the defender, Millen took what the defense gave him. In this case it was a long touchdown. Great read and execution. Cale Millen at the Elite 11 Regionals prior to his senior season. You can see the effect of the unanchored trail leg issue in some of his passes. They tend sail on him and it affects his accuracy. When he anchors and throws off of his back leg it generates the velocity and accuracy that is required at the D1 level and beyond. This is a correctable mechanics issue. 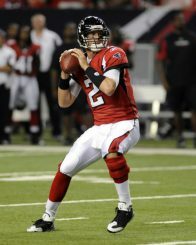 Matt Ryan, who starred at Boston College and was selected in the first round (No. 3 overall) of the 2008 NFL Draft by the Atlanta Falcons. Ryan and Cale Millen share very similar physical traits and mental/emotional disposition. Both of them demonstrate leadership and command of the huddle that inspires confidence from their teammates. They both share the athleticism the position requires to excel at a high level. Though Matt Ryan is a shade taller than Millen, I’m not so sure that he is a better athlete. After all, how many 16-year old kids can dunk a basketball with flare, or produce a 101+ SPARQ score as a 17-year old going into his senior year of high school? Other quarterbacks that share similar characteristics to Cale Millen are Tom Savage who played at Rutgers and the University of Pittsburg. He was taken in the fourth round (No. 135) by the Houston Texans of the 2014 draft. And Jared Goff selected in the first round (No. 1 overall) by the Los Angeles Rams in the 2016 draft after a stellar collegiate career at the University of California-Berkeley. Both Savage and Goff are Elite 11 alumni, as is Millen. If there was ever a kid ready to play from Day 1 at the collegiate level it would be Cale Millen. He has a rare combination of size, athleticism, leadership skills, and the “ice water” in his veins that you see in established veteran quarterbacks now playing in the NFL. He has an advanced tight and compact throwing motion untainted by years of throwing baseballs in Little League. The throwing mechanics of a baseball are very different than that of throwing a football. He has nice mobility in the pocket and has demonstrated the ability to “climb”, roll-out, extend the play, and throw to both sides of the field with impressive velocity. He has light “calm” feet as the pass rush surrounds him, rather than the choppy steps that you normally see at the high school level. These “happy feet” are a bad habit that interfere with a quarterback’s ability to throw in a variety of pressure situations. Millen has one of the fastest clocks in his head that I have seen on tape from a high school quarterback. The ball comes out of his hand fast in a nice tight spiral. He demonstrates velocity range in that he takes something off the ball on the lower stems of the route tree, and ramps up his velocity on the higher stems (post, corner, go). Millen recognizes defenses (particularly back-end alignments) and exploits them, by audibling out of a play from a pre-snap read. His tape is full of these and he is at an ELITE level doing it. His mechanics are pretty solid. However, he prematurely unhinges his plant (right) leg when throwing, which robs him of his velocity, especially on deep throws. As he matures, with further strength training and coaching, he will anchor his back leg better to transfer that power to his arm so he can drive the ball better. I’m unsure if he goes through read progressions. I saw little evidence of it. In lieu of subsequent reads, he appears to know where he is going with the ball from pre-snap reads much like at the NFL level. In the pros, quarterbacks do not have time to go through progressions. They take what the defense gives them in Pre-Snap and Post-Snap reads which is a more advanced level of reading defenses. This what I saw on tape from Millen. Cale Millen will see the field early at Oregon. He has All-Conference ability and an NFL future. Give Marcus Arroyo credit for stealing a gem away from Northwestern. Spencer Thomas, the Volunteer Editor for this article, is an attorney for the Social Security Administration in Atlanta, Georgia, and coaches High School Football for Hillgrove HS in Powder Springs, GA.